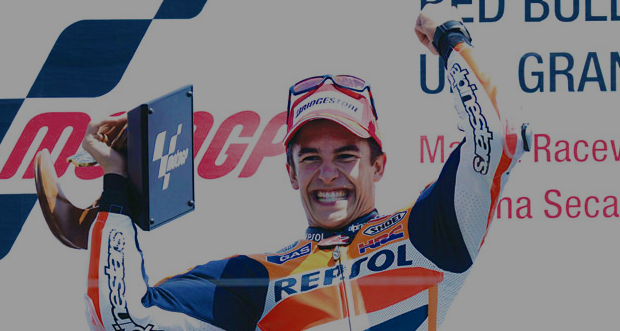 Marc Marquez has won the 2013 Red Bull U.S. Moto Grand Prix at Laguna Seca to further extend his Championship lead. Prior to the days main attraction a minute’s silence was held to pay the respects to Italian rider Andrea Antonelli who was tragically killed in an accident during the World Supersport race in Moscow earlier that day. After the sad formalities were completed it was race time where 20-year-old Marquez started the GP from second on the grid to German Stefan Bradl on Pole. The Spaniard off to a dreadful start, which mirrored that of last round in Sachsenring but he was able to settle and hold onto third in the early stages. The Rookie established race pace behind Valentino Rossi who started from fourth and slotted in ahead of defending World Champion Jorge Lorenzo and championship contender/team mate Dani Pedrosa. Pedrosa and Lorenzo, who both missed last round due to injuries both, had work hard riding with those injuries and poor qualifying times. As all rides developed the feel for the race gaps were evidently opening and closing but one in particular was the gap between Rossi and Marquez. Marc was registering times that were just off qualifying times and a battle between him and the seven times World Champion were inevitable. The Doctor once distinctively battled with Casey Stoner on this track in 2008 and Rossi controversially won that battle on the famous “Cork Screw” section of the track (a tight left then right on a steep decline). It was enjoyable viewing as an enormously brave Marquez pulled the same maneuver on the master himself undertaking him off the track on the inside of the exit, pundits describing it as Rossi being Rossi’ed. Marquez then haunted race leader Stefan Bradl edging closer in every sector. Bradl’s pit crew tried their hardest to give him the “hurry up” posting gap times on the pit wall less than it actually was. There were 13 laps remaining when Marquez made the foreseeable passing of the German and finished the race with comfort and control to extend the Championship lead to 16 points over Repsol Honda team mate Dani Pedrosa. Bradl was ecstatic to hold onto second for his first ever podium finish and Rossi kept his recent form alive with third place going into the mid-season break. Alvaro Bautista finish forth with the battered and bruised paring of Pedrosa and Lorenzo collecting the chequered flag in fifth and sixth respectively. Round 10 will commence after the mid-season break in Indianapolis on 18 August. This entry was posted in Motor Sport and tagged Cal Crutchlow, Dani Pedrosa, Jorge Lorenzo, Laguna Seca, Marc Márquez, MotoGP, Motorsport, Red Bull, Repsol Honda, Stefan Bradl, Valentino Rossi on July 23, 2013 by bradeveleigh. Marquez seems to get better and better. He may be able to match or even beat the records set by Rossi back in the day. Got to love Rossi’s attitude towards every race, even when it doesn’t go his way.